De uitreiking van de Buys Ballotmedaille vond plaats op maandag 23 juni in het Trippenhuis van de KNAW in Amsterdam. 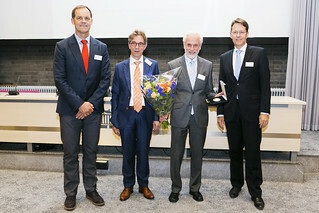 Ter gelegenheid van de uitreiking wijdde de KNAW in samenwerking met het KNMI die dag een symposium aan het werk van Sir Brian Hoskins. 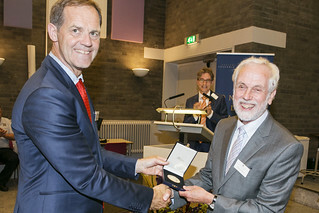 Sir Brian Hoskins krijgt de Buys Ballot Medaille 2014 voor het baanbrekend werk dat hij als wiskundig onderlegde meteoroloog heeft verricht voor het begrijpen van weersystemen en de grootschalige luchtstromingen in de atmosfeer. Potential vorticity combines the dynamics and thermodynamics of the atmosphere in a variable that underlies much of our understanding of atmospheric motion. After a review of its properties, potential vorticity will be used as the basis for a new look at the Hadley Cell. The picture that emerges is very different from that in text books. The development of atmospheric data assimilation since the 1970s has been central to the improvement of weather prediction and the establishment and refinement of a capability for reanalysis of past observations. It has made increasing use of the modelled dynamics of the atmosphere to extract information from the available observations. Understanding of atmospheric dynamics can also be important when diagnosing the performance of data assimilation systems. In turn, the outputs from data assimilation, in particular from reanalysis, have become a mainstay of research into atmospheric dynamics. Examples from the development and application of data assimilation will be presented that link to some of the many contributions of Brian Hoskins to atmospheric science. The state of the North Atlantic storm track determines the winter weather in western Europe. Western Europe is located in a part of the storm track where its behaviour is at its most complex and non-linear. Understanding and predicting this behaviour relies on advanced topics in dynamical meteorology. Many of these topics go back to seminal work by Brian Hoskins and co-workers. The North Atlantic Oscillation (NAO) has traditionally been viewed as operating on timescales of seasons and longer, but recent research has focused on shorter timescales in linking NAO events to the occurrence of Rossby wave breaking. This perspective blurs the distinction between 'weather' and 'climate' to some extent, but it will be shown that NAO variability on very long, multidecadal timescales does appear physically different to that on shorter timescales. As subtropical continents heat-up in spring, it is almost inevitable that monsoons will develop. In my work with Brian, we investigated how monsoons 'explain', and interact-with, the wider circulation. We highlighted the importance of PV modification for the steering of low-level winds that provide the monsoon with its moisture supply, and hypothesised a 'monsoon-desert' mechanism; whereby the descent associated with the dynamical response to monsoons leads to a local diabatic enhancement. My recent work shows how these ideas are applicable to the diagnosis of forecast error. Huw Davies, Professor ETH Zürich - The essence of mid-latitude weather systems? Synoptic-scale mid-latitude weather systems occur irregularly and posses a rich spatial structure with significant case-to-case variability. Hence they are both chaotic and complex. Notwithstanding remarkable progress has been achieved since the 1970s in diagnosing and understanding the accompanying flow dynamics, and these advances have been spearheaded and inspired by this year's recipient of the Buys Ballot Award. An overview will be provided of some of the themes that Professor Hoskins has pursued in studying these systems along with a brief examples of some variations upon those themes.